Durable smoothing, Japanese, Brazilian, straightening… So many services that it is not always easy for a professional hairdresser to explain to his customers. What cosmetic products, what techniques? 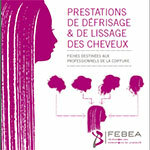 The FEBEA (Federation of Beauty Companies) has just published four practical sheets in association with UNEC (National Union of Hairdressing Companies) and CNEC (National Council of Hairdressing Companies). Knowing the different types of smoothing, the technologies associated with them and the results that can be expected, quickly identifying the service best suited to the client, simply explaining the modes of action and techniques used: these are the aims of these guide sheets, made available free of charge by the FEBEA. There are four of them, one for each of the services of this type that can be performed in salon: straightening, permanent smoothing, temporary smoothing, smoothing care. They are available for all hairdressing professionals and can be downloaded from the FEBEA website. - Download the Straightening and straightening guide for hairdressing professionals on the FEBEA website.